The Democrats and the mainstream media (MSM) talk about a blue wave that’s surely coming in this November’s midterm elections. But President Trump sees it differently. Recent actions by the president show he is setting the stage for Republican gains in the coming election. By viewing America through the prism of economic security, Trump is likely to defy today’s allegedly lopsided polls. Trump believes that the only blue wave coming this November is the one you see if you stand on the beach and stare at the ocean. The GOP could end up with as many as 60 Senators and an increased majority in the House of Representatives. The GOP also picked up six Senate seats, leaving the Dems with a razor-thin majority. But in the 2014 midterm election, the GOP picked up eight additional seats, resulting in a majority of 54 senators. Republicans easily held on to the House. This year, the results will be different. Most current polls show that Trump’s approval rating is in the mid 40 percent range. An independent counsel continues investigating Trump, who had until recently been identified as a subject of the probe. Outside that investigation, Trump is also facing accusations from women who claim they had affairs with him years ago. But these are likely to fall flat at the voting booth, given the Democrats’ cavalier treatment of then-President Bill Clinton’s many female accusers back in the late 1990s. Democrats, however, think that given these negatives, Americans will vote for Democratic candidates in the fall. Trump believes that the positive actions he has taken so far will yield positive results at the ballot box, particularly in the area of economic security for all Americans. He knew that he had to take action quickly once he assumed power. He knew he needed the right people in the right places to win the vote of Americans. So far this year, he has moved quickly to ensure that the stage is set for November GOP success. Trump is solving the most pressing problem: Economic security for all. The most important issue to the American voter is economic security. Economic security, in turn, only comes with economic growth that produces opportunities for all workers. Annual GDP growth in the U.S. hasn’t reached 3 percent since 2005. Since Trump took office, however, GDP growth has averaged about 3 percent. This year, growth could reach 4 percent, thanks to Trump’s tax cut and his relentless eliminations of burdensome regulations. The U.S. also must address its huge international trade deficit, which is what the current “trade war” brouhaha is all about. As the President himself indicated, though, a “trade war” started a long time ago, particularly America’s current trade battle with China. The ongoing trade mess primary evolved out of previous badly negotiated trade deals that favored foreign countries, putting the U.S. at a distinct economic disadvantage. Trump wants this fixed quickly and chose to rattle the sabers to get trade negotiations on the fast track. Indeed, he has threatened steep tariffs, which could allegedly trigger a “trade war.” But, since foreigners sell more to us than we sell to them, foreign countries will be hurt more than the U.S. should a real trade war erupt. Trump’s tough tariff strategy is bringing all parties to the table to quickly renegotiate trade pacts. By summer most deals will be complete, enabling America to compete on a more level playing field. That will further stimulate economic growth and economic security. By November things will look very rosy. Trump is betting that with an economy growing at a 4 percent rate, resulting in record low unemployment and new opportunities, voters will react favorably as their economic security improves. 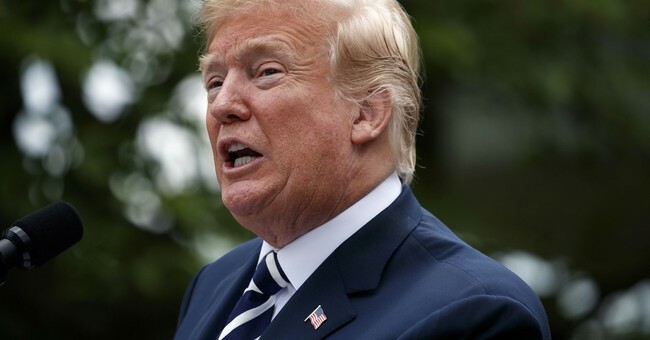 He believes that with ISIS virtually eliminated and with an agreement with North Korea on the horizon, voters will approve of his foreign policy. In the meantime, by September the Mueller investigation will likely conclude, with Trump cleared of any wrongdoing. The president believes the Dems themselves face some jeopardy. The provably fake, anti-Trump dossier that kicked this political street theater off likely received funding from the DNC, which, in turn, became a branch of the Hillary Clinton campaign in 2016. The soon to be released Inspector general’s report will also have some conclusions that will be damning to the Dems. On other fronts, Americans want to feel safe and Trump knows this. As a result, by giving the U.S. military freer rules of engagement and leaving the battles up to his generals, he has essentially obliviated ISIS. In addition, he has brought North Korea to the bargaining table. For the first time ever, North Korea is willing to discuss denuclearization. The president is also moving to quickly secure our border with Mexico, despite current provocations. The Democrats’ insistent #Resistance message will not resonate, particularly if they and their previous presidential candidate become targets of a new and more serious investigation. The biggest question remaining: Why would any voter want to “resist” economic prosperity while enjoying safety from foreign threats?